Cricket Box, originally uploaded by frykitty. Hee...I just realized I said "another new box" below, when I hadn't posted this one yet. It is several decades old (hard to say exactly how old). Though I will proudly serve with it, I certainly would not pack it for lunch. The three shimmering trays are ceramic. 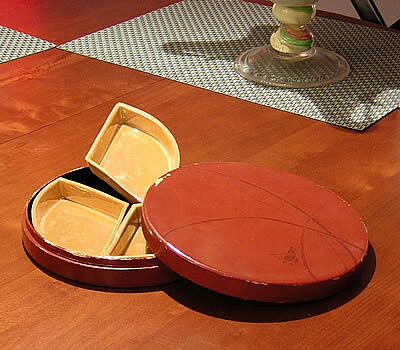 Incidentally, while this was sold as a bento box, I would not be surprised if it serves some other purpose. If anyone knows, I'd love to hear. 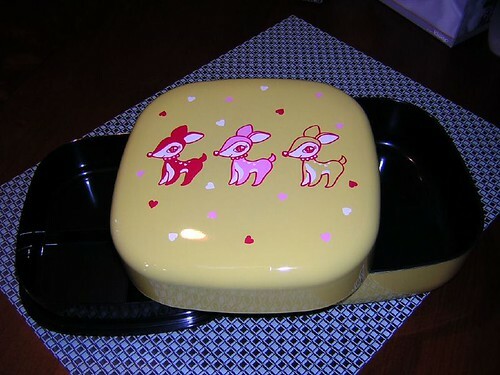 Bambi bento, originally uploaded by frykitty. 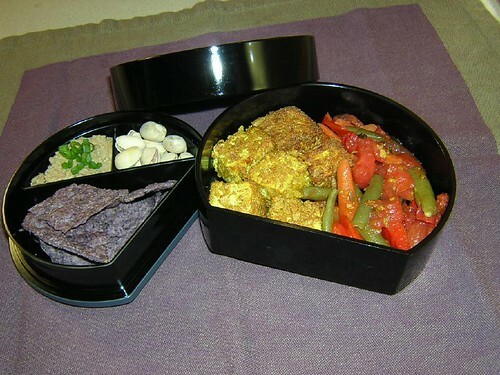 Another new bento box! We went to Anzen today, a rare occasion since it's a bit of a trip. I stocked up on delicious things, and found this box. It's rather large, and would be best used to serve a meal for two. I think I shall use it for a picnic. 06jan25, originally uploaded by frykitty. The brown stuff is Yummy Lentil Splog, recipe below. Spousal Unit (left) has eggs, broccoli, carrots, and a small treat of chocolate (sugar free godiva). I have grapes and a couple honey bbq wings. 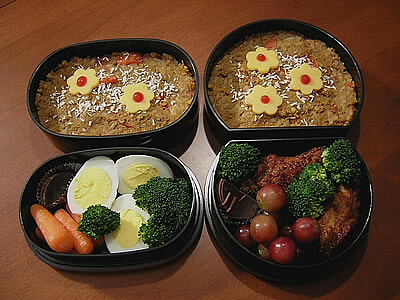 Bento 22 January 06, originally uploaded by frykitty. 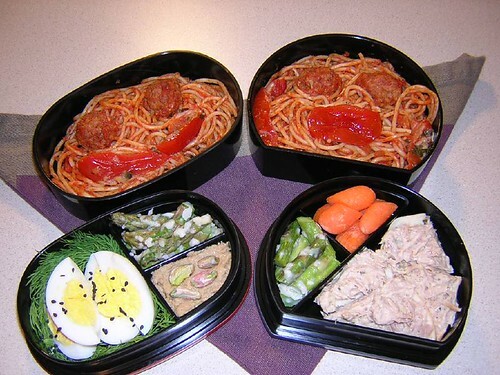 The faces are leftover spaghetti, meatless balls, and roasted tomatoes. For the Spousal Unit (left), eggs in a bed of dill, roasted asparagus, and balsamic hummus with pistachios. For me, carrots and a tuna bagel. 06jan17, originally uploaded by frykitty. On the left is balsamic hummus (storebought) topped with a little green onion, pistachios, and blue corn chips. On the right is some crusted tofu and stir-fried veggies leftover from tonight's dinner. Tonight I made a variation on dhal soup, intended to be thick enough to serve over rice. The result was worth writing down. In a large frying pan, heat the olive oil on medium-high heat. Add the onions and cook until slightly browned. Add spices, garlic, lentils, and stir for just a minute and get everything coated in spices. Add the coconut milk and half of the vegetable broth. Let cook for about 10 minutes. Add the rest of the ingredients, stirring them in well. Cook, stirring occasionally, until the lentils are tender. Serve over rice.